Pituitary homeobox 3 is a protein that in humans is encoded by the PITX3 gene. This gene encodes a member of the RIEG/PITX homeobox family, which is in the bicoid class of homeodomain proteins. Members of this family act as transcription factors. This protein is involved in lens formation during eye development, and the specification and terminal differentiation of mesencephalic dopamine neurons in the substantia nigra compacta that are lost in Parkinson's disease. Mutations of this gene have been associated with anterior segment mesenchymal dysgenesis (ASMD) and congenital cataracts. ↑ Semina EV, Ferrell RE, Mintz-Hittner HA, Bitoun P, Alward WL, Reiter RS, Funkhauser C, Daack-Hirsch S, Murray JC (June 1998). "A novel homeobox gene PITX3 is mutated in families with autosomal-dominant cataracts and ASMD". Nature Genetics. 19 (2): 167–70. doi:10.1038/527. PMID 9620774. 1 2 3 "Entrez Gene: PITX3 paired-like homeodomain transcription factor 3". ↑ Smidt MP, Smits SM, Bouwmeester H, Hamers FP, van der Linden AJ, Hellemons AJ, Graw J, Burbach JP (March 2004). "Early developmental failure of substantia nigra dopamine neurons in mice lacking the homeodomain gene Pitx3". Development. 131 (5): 1145–55. doi:10.1242/dev.01022. PMID 14973278. Smits SM, Smidt MP (2006). "The role of Pitx3 in survival of midbrain dopaminergic neurons". Journal of Neural Transmission. Supplementum. Journal of Neural Transmission. Supplementa. 70 (70): 57–60. doi:10.1007/978-3-211-45295-0_10. ISBN 978-3-211-28927-3. PMID 17017509. Hittner HM, Kretzer FL, Antoszyk JH, Ferrell RE, Mehta RS (January 1982). "Variable expressivity of autosomal dominant anterior segment mesenchymal dysgenesis in six generations". American Journal of Ophthalmology. 93 (1): 57–70. PMID 6801987. Berry V, Yang Z, Addison PK, Francis PJ, Ionides A, Karan G, Jiang L, Lin W, Hu J, Yang R, Moore A, Zhang K, Bhattacharya SS (August 2004). "Recurrent 17 bp duplication in PITX3 is primarily associated with posterior polar cataract (CPP4)". Journal of Medical Genetics. 41 (8): e109. doi:10.1136/jmg.2004.020289. PMC 1735853 . PMID 15286169. Finzi S, Li Y, Mitchell TN, Farr A, Maumenee IH, Sallum JM, Sundin O (September 2005). "Posterior polar cataract: genetic analysis of a large family". Ophthalmic Genetics. 26 (3): 125–30. doi:10.1080/13816810500229124. PMID 16272057. Martinat C, Bacci JJ, Leete T, Kim J, Vanti WB, Newman AH, Cha JH, Gether U, Wang H, Abeliovich A (February 2006). "Cooperative transcription activation by Nurr1 and Pitx3 induces embryonic stem cell maturation to the midbrain dopamine neuron phenotype". Proceedings of the National Academy of Sciences of the United States of America. 103 (8): 2874–9. doi:10.1073/pnas.0511153103. PMC 1413837 . PMID 16477036. Bidinost C, Matsumoto M, Chung D, Salem N, Zhang K, Stockton DW, Khoury A, Megarbane A, Bejjani BA, Traboulsi EI (April 2006). "Heterozygous and homozygous mutations in PITX3 in a large Lebanese family with posterior polar cataracts and neurodevelopmental abnormalities". Investigative Ophthalmology & Visual Science. 47 (4): 1274–80. doi:10.1167/iovs.05-1095. PMID 16565358. Burdon KP, McKay JD, Wirth MG, Russell-Eggit IM, Bhatti S, Ruddle JB, Dimasi D, Mackey DA, Craig JE (2006). "The PITX3 gene in posterior polar congenital cataract in Australia". Molecular Vision. 12: 367–71. PMID 16636655. Sakazume S, Sorokina E, Iwamoto Y, Semina EV (2007). 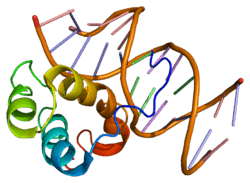 "Functional analysis of human mutations in homeodomain transcription factor PITX3". BMC Molecular Biology. 8: 84. doi:10.1186/1471-2199-8-84. PMC 2093940 . PMID 17888164.